Read more from the Dec Issue and see NEW YEAR N3W YOU in mag. 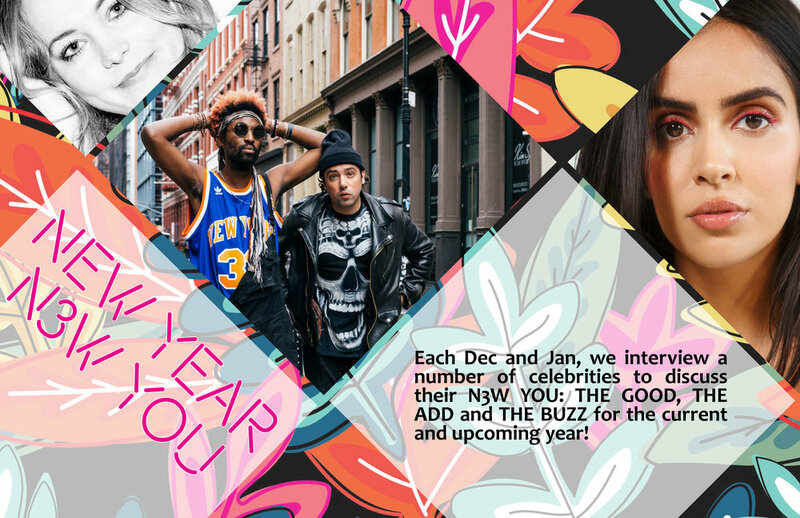 Our second annual N3W YOU (you can see our Dec feature of N3W YEAR, NEW YOU) continues as we share our favorite friends' thoughts on THE GOOD, THE ADD and THE BUZZ that they're looking forward to this year! etc. I was a pescatarian (eat fish only) before going vegan, so letting go of meat was not a big deal, letting go of eggs was. Now I eat a whole food plant based diet 90% of the time, but occasionally I will have a piece of fish. 2018, I want to take that 90% to 100%. In 2018 keep an eye out for my book. My book will inspire millions to live a healthier lifestyle and learn how to incorporate that into their daily life. I want people to learn how to live a “No Excuse” lifestyle and win! I turned 30 in July which I am very happy about. I’m a real woman now, y’all (as I like to say). And... I was offered this show, Let’s Get Physical. I’ve always wanted to try out comedy. Bill Livermore has provided a sense of renewed hope in this goal. This year will be a good one for our wonderful girls as we seek to further this cause. they go for the gold (or green) to win the National Aerobics Championships and the $8 million dollar inheritance at stake, which Joe’s father demanded his “loser son” earn or never have. Throughout the show Claudia exudes her hidden ulterior motives most of which stem from her desire for money, power or both and she isn’t afraid to cut her own husband out to achieve what she wants. not be just a soulless mastermind, so much as a woman who as girl chose power over love. like 30-year-old ‘Naomi Clark.’ On 9-oh Naomi always had her sights set on the delicious looking boys, but deep down she was a nerd-loving, career-driven girl who, too, sold her true self short at times. I joined Alterna Haircare in 2017, so I’m very proud to be part of this luxury brand that creates beautiful, safe-to use products. I’m also really proud of the launch of the Trans Cosmetic Donation Program, it’s always been my goal to incorporate philanthropy into my work. I’ve been planning content for my YouTube channel for some time, so I’m really excited to bring that project to life this year. Definitely stay tuned to my Instagram for news on the YouTube Channel. I’m also working on ways to expand the Trans Cosmetic Donation Program so we can reach and help more people. I’ve got a lot of projects I wish I could talk about, but I’ll be sharing news on my Instagram as soon as I can! journey through 2018! I’ve dreamed about being a part of a show like this since I was a teenager, and the universe finally gave it to me. I’m also producing an upcoming TV pilot, “Broken Record,” with Meghan Trainor and Danny Rose for ABC. This year, I’d like to find a partner that understands and appreciates me. I’ve been single for TOO damn long! I feel like I’ve worked on myself, and I am centered emotionally and professionally. Now I am ready to share myself with someone else, but only with someone who deserves me! I’m not about wasting my time. I am dying over Dr. Perricone Hydrogen water! It's my secret to everything -- Good skin, energy, hangovers… My 6:30am meetings! Read more from the Jan Issue and see N3W YOU 2018 in mag. We started this feature in our Dec Issue which featured a number of celebrities! 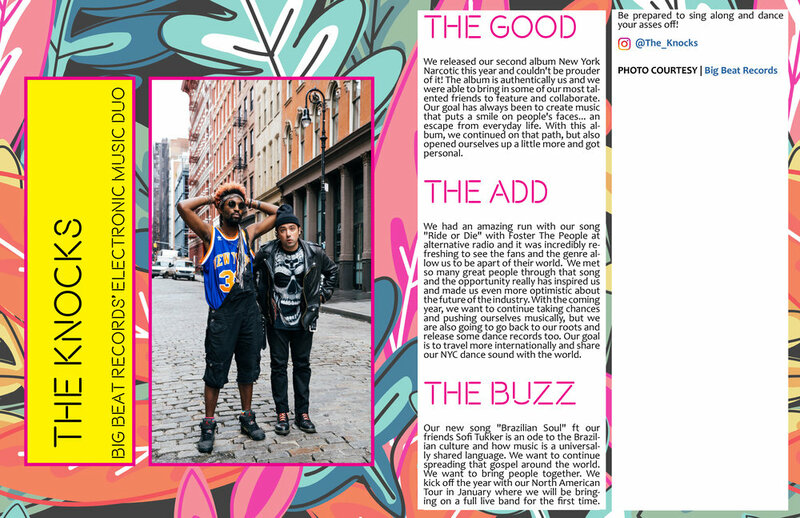 We continued the feature in this month's issue as well. We have our Tone It Up Challenge going on right now (you can sign up HERE for a free starter pack!). It’s basically 6 weeks of total body toning workouts paired with the day-by-day 6 Week Meal Plan to bring fitness results to the next level for 2017! We also came out with 8 brand new workouts called BODY LOVE and 3 of them are with one of our fave fitness icons Jillian Michaels!! They’re absolutely amazing routines that kick some major booty and torch calories. 2016 was a BIG year. We moved to Nashville TN as a newly engaged couple. Living in music city, I was able to meet many talented song writers, and singers who have helped me pursue my passion in singing. It led me to hosting on the red carpet for the 50th anniversary of the CMA’s where I got to meet incredible artists. We have also been fortunate enough to start CitySTRONG, an indoor/outdoor group workout that takes place in cities all across the country. We’ve teamed up with our good friend Erin Oprea, who is also a well known trainer here in Nashville TN. It’s all about getting a good workout, but more importantly, having fun! A portion of the CitySTRONG proceeds go to a charity called “Creativets” which we are very passionate about. It helps soldiers overcome PTSD when they come back from overseas by pairing them up with song writers to help them create music. We are proud of that and have met some amazing people from that organization. Our platform has allowed us to have a voice with many different charities, meet incredible people who make a difference, and hear a lot of inspiring stories. I think when it comes to resolutions, one that stands out to us is being more in the moment. We are all so caught up on our phones, and dealing with the pressure of being a public figure, that we always feel “on.” I think another thing we would love to do is work with more charities and make the world a better place. That is the stuff that evolves and makes us happy. Instagram is fun, but making a difference is rewarding. I know we love to say we will plan a wedding this year. But again, we don’t want it to be because of the pressure or expectations we are under from being on TV. We want to make sure it's when we are ready. Just because we don’t have a date, doesn’t mean we don’t love each other any less. We are busy. And hopefully in 2017 we can start to plan. I’m excited to announce my podcast. I have been brainstorming, and plotting for a while now on how to make it unlike any other. I always have a lot to say, and I like to make people laugh. I feel like I am meant for it. Who knows who will show up on there, but I’m hoping some people I've always wanted to get to know. I have also been co-writing songs, and recorded my first one the other day. I am proud of it and can’t wait to share it with everyone who believes in me. Shawn has been working SO HARD on his fitness and being the best trainer he can be. He is getting new clients all the time, and is also training for an IRONMAN that he will take part in this year. Now THAT’S an ambitious goal for 2017. I've never seen someone so dedicated in my life. You can tell it is his passion. He is extremely knowledgable when it comes to nutrition, health and fitness. Shawn has his own meal plans that he customizes to each person who orders one. It's not about a fad diet, he creates a healthy and achievable lifestyle. Whether you are a mom on the go, someone doing fitness competitions, or even just wanting to live a healthier life. There is something for everyone. He has been working every single day on his website that will be coming out soon for people to get on board. His passion for fitness is what inspired him to start CitySTRONG.com, where we get to meet people across the country and inspire them to be their best selves. 2017 is going to be a great year. 2016 was a memorable year for the books for so many reasons. It was a combination of the best moments in my life as well as some truly difficult times. I was able to qualify, compete, and medal at the 2016 Olympic Games. At the same time all this was going on I was going through some of the worst injuries I have dealt with in my career. It was an emotional rollercoaster, but that's life and instead of getting upset and feeling defeated, I never stopped hustling and never stopped putting one foot in front of the other. It was a time in my life that I felt I was tested emotionally and physically and it just made me grow more comfortable with who I am as well as understanding what I’m capable of. This year I have decided to train and heal differently by slowing down. Athletes think stronger, faster, harder is the best way to go but at some point your body will shut down on you. One goal is to focus on clean eating that will help my body recover and heal faster from intense workouts and practice. Another goal is to improve my ability to be more self aware and strengthen my mindfulness in such a fast sport like fencing if you are worried about what has happened or what will happen, then you lose and I think that relates a lot to everyday life. You can’t be worried about losing a job for example or not getting an interview if you didn’t try to go for it. People tend to focus on beach body mode or losing weight for event and end up freaking out and binge eating. If you just take it one meal at a time, one meal at a time, one workout at a time, one becomes 2 and that becomes 5. Before you know it you went consistently for a month eating healthier and working out more. Making plans is necessary, but when taking steps towards it be in the moment and appreciate the handwork and everything that is going on at that point in time. I recently got signed to Nike and I’m IN LOVE. I have always loved the company and its clothing so now to be a part of the family feels right. I got some things in the works so I can’t disclose them yet, but keep following me and check out my road to success! As of now, I’ve committed myself to training for 2020 Tokyo and I can’t be more excited about it. I love being an athlete and representing the US and I plan on doing it for as long as I can. 2016 was ace! We were able to travel the world on many exciting tours through The America's, Asia, Australia, and all over Europe, played around 200 shows at some of the biggest festivals and nightclubs in the world, hosted our own NERVONation shows at Ushuaia in Ibiza and SLS in Miami, continued our biggest residencies in Las Vegas at Omnia and Wet Republic, and Ushuaia, Ibiza. We were able to connect with so many incredible fans that showed their love and support at every single show and also towards our releases. We launched our own record label GOT ME BABY! Records, had a Billboard Dance #1 with People Grinnin’, released so many special songs, explored a virtual reality 3d music video with “Did We Forget”, had exciting collaborations with Timmy Trumpet, Kylie Minogue, Savi, Amba Shepherd, and Nicky Romero - among others, and reached the DJ Mag top 100 poll as highest ranking females. On a personal level, we have become very close with the team of people we work with, creating our own little family and we were lucky enough to to take our brother on the road with us for three months where we built some everlasting memories. We can only hope 2017 is as special and we are very grateful for the good times in 2016! Any creative person will tell you that they struggle with evolving and balance. You see, our jobs are all encompassing so we are “on” 110% of the time. This can work against finding down time, but we need this “down time” to come up with new ideas, so I guess you could say it is a constant battle. In 2017, we will keep trying to find the perfect balance. Like every year, we will continue to keep pushing boundaries, to keep growing musically and explore different genres. We are releasing a more pop record in February through BigBeat, Warners, which may or may not connect with our fans, but to us, we are excited about trying something new. Prioritizing studio time is also super important for 2017. We need to set aside time to be creative in order to fulfill our creative aspirations so this will be a major focus for us. Giving back to charity is also a goal for 2017. In the past we have been involved in Breast cancer charities. We chose Breast Cancer because our mother survived it, but we are also interested in some other charities which we hope to work with this year. 2017 is going to be another very busy year for NERVO! Aside from working up our label - GOT ME BABY! Records, we have some special collabs coming with DVBBS, Danny Avila, Quintino - to mention a few. We teamed up with some people in the business to launch our own management company called 25Eight Entertainment and we will be announcing some new artists and clients that we are working with in 2017 and beyond. Our NERVONation shows will be back at Ushuaia in Ibiza, as well as Miami for Music Week and also taking it to the slopes in Austria, Solden. From March onwards, we are back on a heavy touring schedule and are super excited about playing Lollapalooza in South America. This year was a huge year for me professionally. I got cast on Khloe Kardashian’s new docuseries REVENGE BODY, set to premiere on E! January 12th, 2017. I’ve been working in the fitness industry my entire adult life and I’m so excited for the world to see this show, because it’s not about extreme weight-loss it’s about health and being the best you can be from the inside out. out on the joy of achieving them. My program 8 Weeks To Change Program has helped so many people find big time fitness results and increased happiness in their personal and professional lives. Because of this the Program has gotten a lot of national attention from The Steve Harvey Show, The Doctors, & E! In 2017, I’m looking to expand 8 Weeks To Change Programs across the country and create a virtual environment which allows me to help people in all parts of the world find their inner athlete and the courage to be who they were born to be. I’m also looking to complete my first book and continue to spread the message that fitness isn’t about the scale, it’s about finding health from within. If I were to choose one word to describe how I’m looking to live my life in 2017 it would be FEARLESS. I'm going to actively work at being the best I can be everyday, forcing myself to live life consistently outside of my comfort zone. Being fearless involves tremendous courage and to be courageous you must be confident in the unknown. In order to grow my business and stay on top of what’s hot and what’s not, I’ll be hiring several more people to work on expanding my brand. That involves me learning to delegate and not be such a perfectionist control freak (hahahha). Some of my personal resolutions involve not being so hard on myself and learning to be more flexible and adventurous outside of work. Last year Khloe Kardashian selected me as one of her go-to celebrity trainers on her new E! Show Revenge Body. The show premieres January 12th on E! I’ll being doing a fitness retreat in Bali with 14 lucky people looking to change their lives from the inside out. I’ll also be doing some clothing collaborations with Carbon38, which will launch in February 2017. I think watching my son grow up is a beautiful thing, watching him develop. Internationally, I was just in Finland with a partnership I'm working on there. Being approached by Care Bears was very dreamy for me. I’m working on a podcast so I hope to have that checked off. Then also just expanding in licensing into a few more countries. Care Bears is in the first quarter of 2017 and in the second in a big way. My Colette partnership in Paris is another major buzz as I brought Care Bears In for that. I'm looking forward to spending more time chanting and reflecting, to get really grounded and clear-minded for 2017. I'm really excited to offer one Latino chef from New Orleans a scholarship to The International Culinary Center in New York. 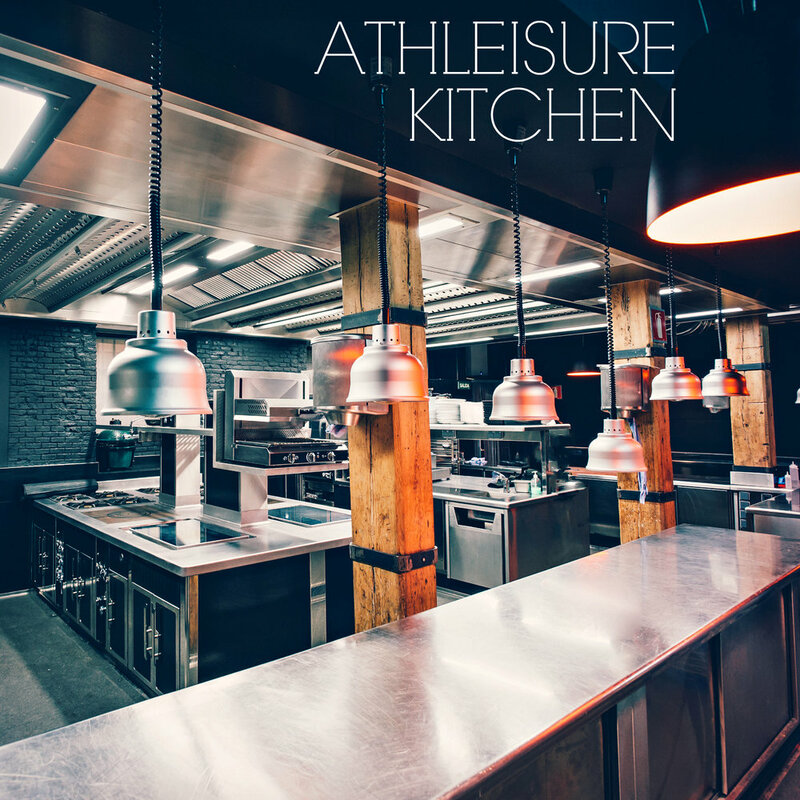 It can be difficult to work your way up the ladder from dishwasher or line cook to executive chef. There aren’t many opportunities for aspiring chefs, especially from the Latin community, to get to that next level in my opinion. The scholarship, which is part of the John Besh Foundation and its Chefs Move program, is necessary to overcome financial barriers. As part of the scholarship, I'll mentor the winner and take him/her with me to Mexico. I hope to eventually give out multiple scholarships in one year. One of the things that made this year so special is how I realized the growth of my brand and the ability to clearly see how far I’ve made it in my career. A huge moment for me was when E! reached out for me to be on Revenge Body By Khloe Kardashian. Being on television training people and helping them was something I has spoken into existence around November 2015. Seeing the lives I've changed helped me to be more confident and helps me to push forward. This was a major moment of affirmation and understanding for me how powerful your words are, the lives I’ve changed, it's helped me be more confident. Traveling to Spain for two weeks with my first NBA client was also special this year. It was there we really sealed our bond. I never thought I’d be working with an NBA player, yet alone traveling the world. The trip allowed me to reflect and put my journey into perspective. I can double down on my discipline. I believe that in everything you do there must be discipline. when we fall short on our discipline, we make make mistakes and mistakes mess up our game plan. In order to stay focused on my goals, discipline is key and it’s something I have to truly work at. Timing! Using time wisely can can help achieve all my goals this coming year. We always like to say we don’t have enough time, but that’s impossible. We have 24 hours a day to take care of everything we need to take care of. We have to have the discipline to make time to do the things we have to get done. I'm super proud to announce I just launched my new website CoreyCalliet.com, where I'll be uploading videos, workout plans and showing a different side of me with my blog. My blog will discuss how to stay motivated, eat right and even give a little relationship advice! I’m also working on my athleisure line and preparing for more television appearances. The goals for 2017 are to continue transforming more bodies and building my brand. It was a great year for women! Team USA's women won the most medals this year in Rio, seeing Serena Williams come out with such a strong voice this year and even Hillary Clinton's run for president. I am really excited to share more about myself! A lot of times, when the Olympics are over, people wonder what we do, how we train, and our recovery from injuries. KristiCastlin.com will do this so that they get to know more about me, “Hollywood,” which is my personal style and my road to the Olympics for 2020 in Tokyo. I'm starting to work with brands in terms of my sponsors/endorsements in 2017! CRAIG: No doubt the biggest blessing and game-changer for 2016 was Sybil Ann Melvin who burst onto the scene November 5th. She and our 2 1/2 year son fill our days (sometimes long) and nights (sometimes short) with laughs. I didn't believe the countless people who warned us about how fast it goes, but they were right. It's flying by. We used to cuddle up at night and watch shows. Now one of our favorite hobbies has become watching the lightbulb in our son's head go off almost daily now as he gets something for the first time or creates a clever new way to challenge us. Lindsay and I spent a fair amount of time reflecting on our dating days in Washington, DC and marvel at how that turned into this. LINDSAY: Overall, I'd say the blessing of good friendship is a big one for me. The gift of our new daugher has given me more time to focus on and get to know the amazing women I normally don't have time to hang with much because of how busy my work schedule is. It's been moments like listening to a girlfriend's story at a coffee shop or walk at the beach that has meant a lot. A place that started off our year on a great note... A magical trip to Sedona, Arizona. We went there last Feb. to Enchantment resort. I think about it all the time. Such wonderful amenities in the most serene and relaxing setting. CRAIG: This time last year, I resolved to be more present so I could enjoy some of my special moments more. I did it.... for about three weeks. I'm recommitting to putting down my phone for large swaths of time, occasionally cutting myself off from the digital world, and rediscovering the great art of conversation. I'm going to text less. There are also the annual pledges to work out more and eat and drink less. Thinking there's a greater chance for a digital detox. We'll see. LINDSAY: My goal for 2017 is to allow creativity to play a more dominant role in my life and my career. This is the year I'm going to create something. It may be as random as the perfect eyemask to promote sleep (something we could all use more of) or as consuming as a new show but damnit, it's gonna happen. I'm going to spend more time living in the moment and not worrying about what is or isn't ahead and relishing in my kids discoveries and happiness is key. I am committing to worry less and to get away with my husband to a place we've never been. CRAIG: As for upcoming awesomeness, look for me in places outside the news space. Perhaps some sort of fantastic project or venture with my favorite collaborator...my wife. We're doing well at making babies. Maybe it's time to see what other compelling content we can create. LINDSAY: Stay tuned...exciting things ahead this year, but besides things I'm looking forward to career-wise, I'm excited about stepping outside of my comfort zone working on some passion projects that will challenge my creativity and also spending more time doing work to helping others. I'm looking forward to cohosting the leukemia lymphoma ball in Washington DC with my husband this spring and working to raise money for cancer research impacting both adults like my Dad as well as kids battling pediatric cancer. Wrapping another very successful season on “The Biggest Loser” was an amazing way to start my year! Of course it felt good to have my contestants win both the at home and championship prizes, but I was so proud of all the contestants. Their courage continues to inspire me and others to consider what can happen when you believe in yourself. Another big moment for me this year was being named the face of women's fitness for Reebok! As a global ambassador for the brand, it's my responsibility to help more and more people take those first steps of fitness, so that's exactly what I'm going to do. On a personal level, this year was particularly special for me because I had the privilege of officiating two of my best friend’s weddings. Such incredible and proud moments for me. And to top off an amazing year, I adopted my rescue dog Hank! In the midst of this beautifully, crazy year I have lost my way when it comes to taking care of myself. It's ironic to say as I'm the one that teaches this to people, but this is my reality so I intend to embrace it. I freely and passionately love to give to others, but it is my resolution to work on balancing that output with more input... more time and joy for myself. My first book, DIET RIGHT FOR YOUR PERSONALITY TYPE, will be on shelves February 7th! I just had to write this book... finally an eating guide that's customized for the reader, honoring their strengths and personality. This book will prove what an asset they are in their lives and help them lose weight in a healthy sustainable way. As of the New Year, I will also be a featured columnist each month for Shape Magazine and have joined their board of directors. In addition, I have been brought on to be the North American spokesperson for California Almonds. I believe we must all be accountable for our own greatness. As I teach others to do it, I will walk the walk and do it for me as well. Promise!